Description: This demonstration visually shows that a mirror can focus Infrared waves at the focal point. Large parabolic mirror on large metal stand. Take the large parabolic mirror off the top and attach it to the middle S clamp on the stand. 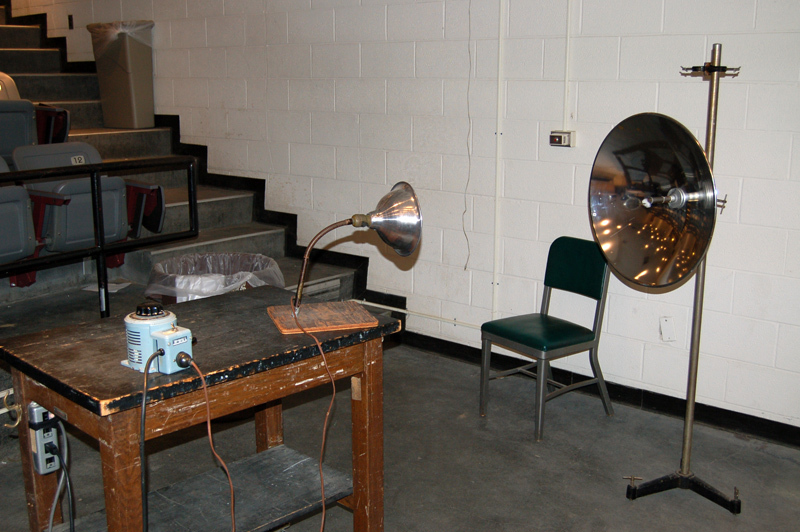 Place the Parabolic mirror and stand inside the classroom. Position the heater element at mirror level and aim it directly at the center about 3-4 feet away. Connect the heater element to the VariAC and set it to 140VAC when it is off. Include about a 2cm blob of gun cotton. 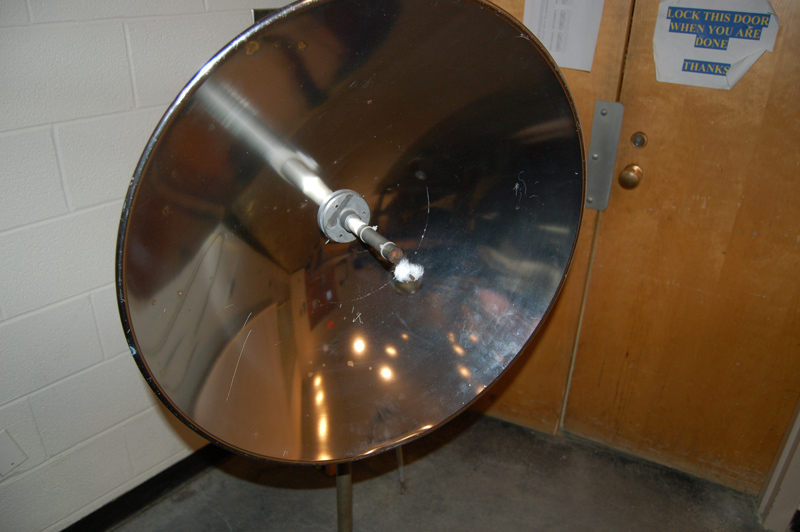 When ready, place the gun cotton on the rod in the middle of the parabolic mirror. Position the cotton at the very edge of the rod, as this is where the focal point is. Turn on the VariAC and let the heater element heat up. Within a minute or two the gun cotton should ignite. This happens because all of the IR waves are being focused by the parabolic mirror at the focal point, where the gun cotton is. The intensifty of the IR waves is enough to heat up the gun cotton to the point where it ignites. A match taped at the focal point can also be used in place of the gun cotton. When finished, turn off the VariAC. Note: The switch on the heat lamp does not work. To turn it off use the VariAC.